Escape to a world of peace and tranquility. 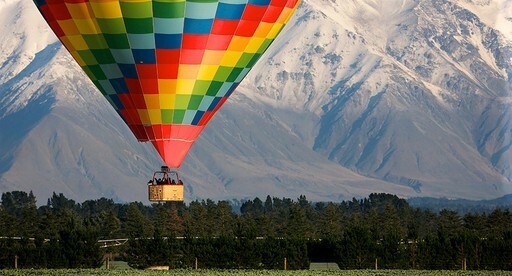 Hot Air Ballooning is a magical experience and a flight with Ballooning Canterbury offers panoramic views across the fertile Canterbury Plains to the Southern Alps. Courtesy transfers to and from most Christchurch Hotels for visitors to Christchurch. An early start: Ballooning is best at sunrise, when the weather is calmest and to make the most of the beautiful morning light. Allow approximately 4 -5 hours for this remarkable experience; you will be contacted the evening prior to your flight, giving you details of your meeting time and place. The actual flying time is approximately one hour. It is a hands-on experience. Passengers are actively encouraged to help the pilot and crew with the pre-flight inflation and packing up at the conclusion of the flight. Spectacular views and fantastic photo opportunities. A glass of chilled champagne or fruit juice and a light snack after landing. Group rates are available for 6 or more passengers. Ballooning Canterbury is a family owned and operated business which has been operating since October 2012. Michael is passionate about flying. He is one of New Zealand’s top balloonists and has been flying balloons since 1997. Michael has won national ballooning events throughout New Zealand and has represented New Zealand at the World Hot Air Balloon Championships in Mildrua, Australia. Nicholas has been flying in balloons since he was 4 years old. He had his first solo flight at 12 and won his first Balloon Fiesta at 14. At 22 he gained his Commercial Hot Air Balloon License and started flying for the family business. Kate has a background in tourism and aviation having worked for Newmans Airways, Ansett New Zealand and Qantas New Zealand. She has been married to Michael since 1989 and they have 2 children, Nicholas and Hannah, both of whom have inherited the love for flying. Hannah is a Radiographer but in her spare time helps out with the company’s Facebook and Instagram.